2015 to date Appointed to the Personal Property Resource Panel of the Appraisal Foundation in Washington, D.C.
2014 to 2015 Teaching appraisal of original prints, New York University. 1978 to date Appraiser of fine prints, general, 19th, 20th and 21 st century paintings, drawings and sculpture. Appraisals for schools, universities, banks,corporations, insurance companies,lawyers,accountants,collectors and investors. 2009 to date Member, Salvador Dali Research Center-Study and protection of the patrimony of Salvador Dali. 1986 to Jan. 2012 Member, Appraisers Association of America, Elected 1st Vice President 2005-2007, 2nd Vice President 2003-2005. Board member 1999 to Jan. 2012. Regional Representative for New York State 1993-1999. Lecturer and panel member for AAA programs. 1999 to date AAA Certified member of Appraisers Association of America. Completed proficiency examinations in appraisal methodology and ethics and in the field of original prints. Recertified to June, 2018. 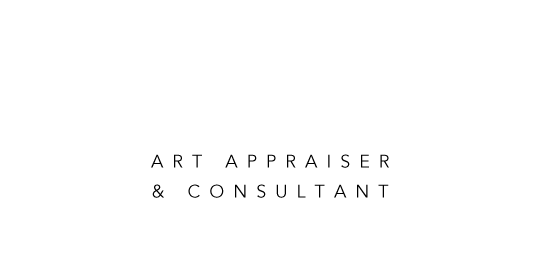 1979 to date Art consultant to corporations, schools, universities, artists, professionals, collectors and estate beneficiaries for purposes of acquiring managing, disposing of, protecting and framing of fine art objects and collections. 2004 Consultant to Rochester Institute of Technology, School for American Crafts metal bench competition. Benches for a city park. 1999 With Rochester Institute of Technology and the Grove Place neighborhood ran a competition for a sculpture commission for Via Health. 1998 to date Member, Aesthetics Committee for public art on Route 490 and two additional New York State highway design projects. 1997 - 1999 Coordinator of the Xerox Archival Project. 1997 Conference Chair, National Association of Woman Business Owners, the Girl Scouts of Genesee Valley and An Income of Her Own. 1997 Administrator of Women's Art Works 7, National competition for women artists, sponsored by Bausch & Lomb. 1997 Advisor to the City of Rochester, public art competition for the Gateway Pavilion and the Erie Harbor project. 1995 to date Curator of the Gallery at One Bausch & Lomb Place, Rochester, New York. Four exhibitions per year. 1995 Consultant to the Jewish Home Foundation. Sculpture competition for the Atkin Adult Day Health Center. 1995 Chair of Rochester Women's Network ~ Awards Committee. 1993 - 1997 Board member, National Association of Women Business Owners (NAWBO). 1993 - 199 Art Administrator of Bausch & Lomb art collection and archival project. 1989 - 199 Chair, Monroe County Public Art Committee. Art selection for the new airport. 1989 - 1990 Curated exhibition of the Columbia Banking collection. Wrote accompanying catalogue. Delivered opening lecture. Rochester, Elmira, and Penn Yan, New York. 1989-199 President of the Board, Arts For Greater Rochester. Monroe County Arts Council. 1987-1989 Vice President for Programs, Arts For Greater Rochester. Responsible for the strategic plan, future planning, and current programs. 1985-198 Principal in the Western New York Print Fair, an annual January event where nationally known print dealers exhibit at the Wilson Arts Center, Harley School, Rochester, New York. Responsible for art selection and arrangements for print exhibition accompanying the fair each year. 1980 Founding member of Rochester Association of Art Dealers. Past President and board member. 1979 - January 1985 Gallery Director, Artworks at Sibley's. 1979 to date Art exhibition Judge for museum shows, art groups, art community exhibitions. 1979 to date Lecturer to museum audiences and to other organizations on art-related topics. 1971-1975 Assistant to Robert Henning, Memorial Art Gallery, for the cataloguing of prints in the museum print room. 1971-1975 Chair, Lending and Sales Gallery, Memorial Art Gallery. Responsible for the selection of art for ten exhibitions per year and for art consigned to Gallery members and for public sale. 1970-1976 Member, Board of Managers, Memorial Art Gallery. 1962-1980 Docent, Memorial Art Gallery. Responsible for interpretation of the collection at all educational levels. Docent Emeritus status at present. 1959 to date Collector of l9th- and 20-century European and American prints. Developed extensive personal research library. November 2017 Belmont Society Award for contributions to the Appraisers Association of America over the course of 25 years or more. 2015 Betty Strasenburgh Award from the Community Design Center of Rochester for activism in the arts. 2000 Arts & Cultural Council for Greater Rochester - Special Citation for outstanding service to the cultural community. October 1998 Top Woman Business Owner of the Year Award for Community. National Association of Women Business owners, Rochester Chapter. Brighton Chamber of Commerce volunteer award. May 1995 Greater Rochester Metro Chamber of Commerce Civic Award for Culture and Arts. University of Rochester, Rochester, New York - M.S. in Humanities. Studied the art and culture of l9th- and 20th-century Germany; worked extensively in museum print collection. 1975 - 1977 Nazareth College, Rochester, New York - German Language Studies. 1955 - 1959 Cornell University, Ithaca, New York - B.S. October 1999 Lecture, "Appraising Old Masters to 20th Century Prints: Originals, Copies and Everything In Between", Appraisers Association of America Lecture Series, New York. June 1992 Organized exhibition of the prints of Hermann Katelhon for the Lockhart Gallery, Memorial Art Gallery. Organized exhibition of the prints of Howard Hodgkin in collaboration with the Oxford Gallery, Rochester, New York. October 1984 Organized the exhibition and wrote the catalogue entitled Expressionism and Neo-Expressionism Graphics: The Inner Vision. Wilson Arts Center, Rochester, New York. Organized an exhibition of prints by Kathe Kollwitz at the University of Rochester. Wrote detailed catalogue entitled Prints for the German People involving research in the print cabinets of Dresden, Berlin, and Stuttgart. Summer 1977 Research for the Northeast American Society for Eighteenth-Century Studies exhibition at the University of Rochester. Wrote catalogue essay: "The Graphic Art of Eighteenth Century." October 1977 Curatorial aide to Dr. Bruce Chambers, Memorial Art Gallery, for special print research. Conducted independent study to research large collection of prints of unknown origin. Spring 1978 Master's thesis "Max Klinger: A German Symbolist." Special study at Cornell University under Professor Peter B. Kahn.